Everton's Kurt Zouma celebrates his goal against Bournemouth with Andre Gomes and Lucas Digne. 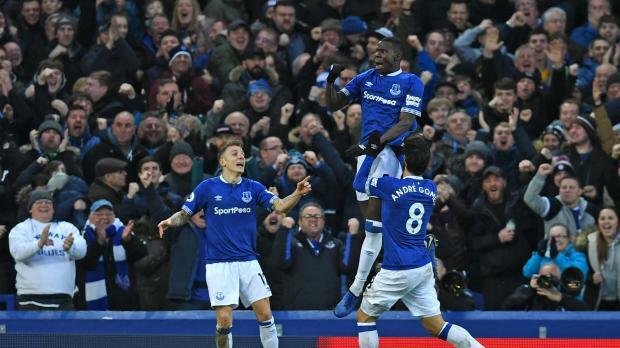 Kurt Zouma's second-half header and substitute Dominic Calvert-Lewin's stoppage-time strike saw Everton beat Bournemouth 2-0 on Sunday as they climbed into the top half of the English Premier League table. This victory was just Everton's second win in nine league matches and the first time they had kept a clean sheet at their Goodison Park ground since November 24. The deadlock in an often frustrating match was eventually broken when, with Everton having had just one shot on target and south coast visitors Bournemouth a mere two, Zouma -- on loan from Chelsea -- scored his first goal for Everton in the 61st minute. An Everton setpiece was cleared by the Cherries' defence before Lucas Digne kept the ball alive on the left. His flighted cross left Nathan Ake kicking at fresh air and, with goalkeeper Asmir Begovic not coming to collect, the onrushing Zouma leapt to power in a header that delighted the home crowd. A nervous Everton then had to survive concerted Bournemouth pressure at the end of a rainswept encounter before, in the fifth minute of stoppage time, the Toffees put the result beyond doubt. Ademola Lookman did well to win the ball back and then, rather than just run it into the corner, he had the awareness to lay it back into the path of Calvert-Lewin, who had only been introduced into the action by Everton manager Marco Silva in the 87th minute. Calvert-Lewin, who had replaced Richarlison, still had work to do but his low strike from some 16 yards out arrowed into the corner of Begovic's net.